I awoke well before dawn this morning and couldn’t fall back asleep. So I grabbed my camera, walked around, and practiced shooting the pre-dawn light, with which I have little experience, save perhaps a few “end of the night” portraits back at Washington State in the early 1990s. Since we were back on the eastern side of the crest, with big east faces of the peaks above us, I was excited to watch the morning alpenglow here. To see it completely unfold, moment by moment, is a special thing – the light changes subtly but continuously, and within the span of minutes, the whole scene is gone, to be stored in the mind’s memory or on pixels, or perhaps enjoyed live again, 24 hours later. The day would promise to be a hot one again, and by 8:30 AM I was baking and already craving a swim. I walked up the lake a bit, to spare my mates the shock of having to know that I was planning on a skinny dip, and found a nice secluded bay with a deep drop off. After stripping, I walked to the edge of the water, ankle deep, and found the glacial-fed lake to be astonishingly cold. I spent several minutes mustering up the courage to go for it, and inched my way ever so deeper – now up to my knees. And there, all alone, except for me and God, I tapped into all of the remaining bravery of a 45 year old man with little left to prove, and dove into the deep. What happened next is not entirely clear to me. A combination of my brain freezing, my heart stopping, my manhood disappearing, and my muscles seizing eventually brought me to the surface of the water, where I planned (just minutes ago) to whoop with joy. Instead, a decidedly unmanly yelp escaped my lips that sounded more like a poodle getting her poofy tail slammed in the RV door than a manly mountain man taking a swim in a glacial lake. Oh well, it was worth a shot. I washed up, did some laundry, dried in the sun, and waltzed back to camp like it was #nobigdeal. 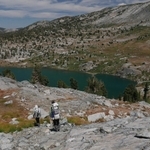 We left the beautiful Marie Lakes Basin around “late morning” and headed to the trail leading out of the basin – the first man-made track of any substance we’ve seen in several days. We traveled two hundred yards on it, had enough, and peeled off to the south down a pathless talus-and-tundra draw. 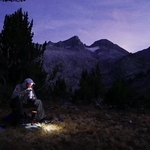 After dropping two hundred or so vertical feet, we found ourselves once again among sparse stands of large whitebark pines and easy walking through meadows towards the northern aspect of Mount Davis. We stopped for a break at the “nearly” fishless Rodgers Lakes in a pretty meadow way below Clinch Pass – the col we climbed and descended yesterday. Looking up at the rubble, we were glad for an easier day today. We then climbed the easy col separating Rodgers Lakes and Upper Davis Lake, descending stable talus down to the lakeshore. I walked along the shore casting my tenkara rod and managed to pull in a few pan-sized brookies as well as a whole bunch of smaller ones. At the outlet, we took a break and scouted down valley for a possible camp in the basin, peering over the edge of the hanging cirque down to the lush and shady-looking Lower Davis Lake. We saddled up the packs and walked down huge granite slabs to the water, walked around its northern shore, crossed the outlet, and found a beautiful campsite with a view up-valley to Mount Davis and its glaciers, with Lower Davis Lake unfolding its mass of water before us. Best of all, a lovely stand of ancient whitebarks provided us with heat-of-the-day shade. I joined up with him as evening wore on and we managed to catch a panful of brookies on our circumnavigation of the lake. We steam-baked them in the fry bake with oil and spices, and enjoyed a hearty first course. The second course consisted of the remaining anemic portion of stroganoff. I added a packet of almond butter and some cream cheese along with a dollop of brown sugar, stuffed the goulash into tortillas and fried them to a crisp. Yes, it was amazing. A colder evening hopefully means a better night’s sleep for me, but I’ll likely not want to miss the early morning alpenglow on Mount Davis, so my pyramid shelter doors will remain peeled open again! Tomorrow: more trout hunting as we continue to make our way south back to Devil’s Postpile. 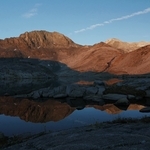 – Morning alpenglow at Lower Marie Lake. – Descending into Lower Davis Lake. – Chase enjoying stroganoff remnants as the light fades.